Enterprise resource planning is a suite of integrated apps used for collecting, storing, managing, and interpreting data. ERP covers various business processes and helps to manage such resources as raw materials, cash, production capacity, and stocks in real time. Besides, it monitors payrolls, orders. and purchases. Thus, by using a robust ERP system, you can easily turn your Magento 2 website into a more profitable business unit. To achieve this goal, choose one of the following ERP integration Magento 2 extensions. 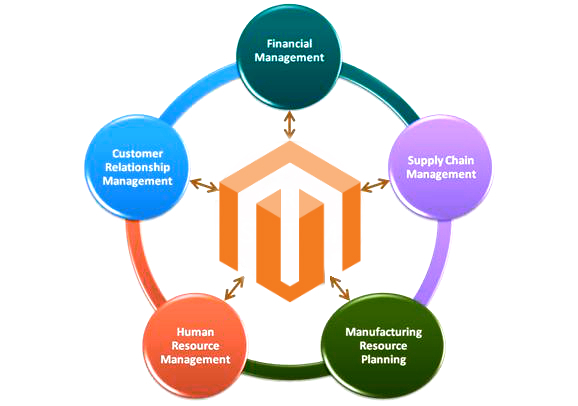 If you are looking for Magento 1 modules, examine this link: Enterprise resource planning (ERP) System Magento Integration. Although you may find dozens of ERP definitions on various websites and blogs, we’d like to draw your attention to the essentials of this powerful set of tools. A robust ERP solution is vital for every Magento merchant who wants to run his/her business successfully and efficiently since it dramatically improves numerous backend processes that take place in your admin and beyond. Note that it is only the tip of the iceberg and an average ERP solution is way more complex and fully-featured. It combines numerous functions into one complete system integrating multiple processes and various data flows across the organization. As a result, you get control for the entire enterprise based on a shared database that supports multiple functions utilized by different business units. ERP nature enables you to eliminate borders between various divisions of your company. Everyone can rely on the same information using it for the specific needs of every particular department. The more advanced ERP systems support business intelligence, asset management, and e-commerce. But if you already have a Magento 2 storefront, it can be easily integrated into any ERP system with the help of Improved Import & Export. It is also worth mentioning that in the case of a vertical organization, ERP usually provides industry-specific features for retail, government, healthcare, nonprofit organizations, etc. Thus, the ERP components may differ a lot depending not only on the selected system but also the needs of the enterprise. Let’s take a look at some basic modules and try to find out how they serve your needs. Financial Management – take full control over your capital inflow and outflow: monitor expenditures, view balance sheet, take care of bank reconciliation, and implement tax management. Get various reports describing each financial aspect of your enterprise. CRM – boost customer service by leveraging a 360-degree profile of your customers. Consolidate such customer data like their social media activities, purchase history, and past interactions with support. Sales & Marketing – handle sales inquiries, quotations, sales orders, invoices, taxation rules, and other related things. Let ERP automate various processes to manage your enterprise in the most efficient way. HRM – leverage standard human resource management tools: time tracker, timesheet, employee records, job profiles, skills matrix, etc. Performance reviews and a payroll system are often a part of an HRM module as well. Manufacturing – improve the whole area of manufacturing by implementing product planning, materials sourcing, daily monitoring, and forecasting. Get total inventory control to avoid situations when you run out of resources. SCM – manage your supply chain and purchase orders, control product flow from production to consumer, implement user-friendly returns, and process automation to streamline your entire supply chain. Inventory – measure stock targets, standardize replenishments, create more efficient inventory goals; track and locate items in your organization. Purchasing – manage the processes of materials procurement. Although these are the most common components of every ERP system, you may also find lots of other modules designed to satisfy industry-specific needs of demand of a particular business. Synchronized reporting and automation of core processes are two integral parts of every robust ERP system. You don’t need to maintain multiple separated systems or unintegrated spreadsheets manually. An ERP platform replaces the gaps between them with a continuous flow of data. Consequently, all reports are based on the data from the entire enterprise and can be generated automatically according to a schedule or when a certain action takes place. Imagine a situation when sales orders are fully automated. It means that that the corresponding data is passed to the financial system automatically – no manual re-keying is necessary! As a result, your order management department can process orders more quickly and accurately. Furthermore, the automation dramatically simplifies the daily routine of your finance department: the corresponding employees can close the books faster. A universal dashboard is another common ERP feature. It enables employees to quickly understand the business’ performance on key metrics providing the most in-depth insights into the health of your company. The more modern an ERP system is – the more user-friendly, intuitive, and vibrant its dashboard is. There are three different ERP types regarding the implementation. First of all, it is a cloud ERP. This solution is usually available anytime anywhere, so you can control your enterprise remotely. All data is stored on external servers. On-premise ERPs represent the second type, which may not include instruments of a remote control. As for data storing, local servers are utilized. And of course, there is also a hybrid type that combines features of cloud and on-premise ERPs. It means that you can run some of your ERP applications in the cloud and some on-premise. Now, when you are familiar with the core functionality of ERP, let’s take a look at the core benefits of connecting your Magento 2 website to an enterprise resource planning system. Higher Productivity. Since the core goal of every ERP is to streamline and automate core business processes, everyone in your organization benefit from that. Your employees can do more with fewer resources. Lower Operational Costs. Defined and more streamlined business processes allow decreasing operational costs. 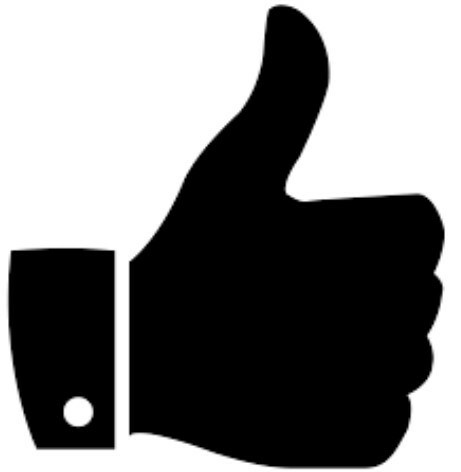 as well as easily share results with everyone in the company. Lower Risks. Due to advanced business visibility and control, you can ensure compliance with regulatory requirements and reduce risks. Complex Things Stay Simple. Since integrated ERP applications share a common database and are synchronized, you can simplify the way your employees communicate and work. Consistent Infrastructure. All departments are ordered and synchronized. Furthermore, the related activities get the same look and feel. Thus, not only productivity increases but also user-adoption rates. Improved Agility. Efficient operations, real-time data, and other ERP features substantially increase agility. Enhanced Collaboration. With a unified system that provides a user-friendly interface for every employee, you dramatically enhance collaboration within the company. All data can be seamlessly shared increasing the efficiency ao the whole enterprise. Costs. No ERP system is available for free. Even if you know a free tool, you need to connect this ERP solution to your Magento 2 store and this procedure won’t be cheap. Although the cost of software, its customization, configuration, testing, and implementation is often high, you will quickly return your investments. Time. The more complex your ERP project is, the more time you need to synchronize it with your e-commerce website. 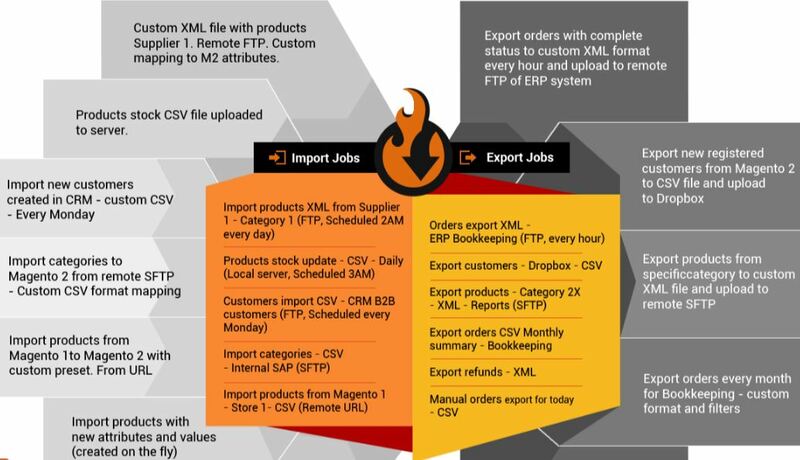 But Improved Import & Export dramatically improve every Magento 2 ERP integration, reducing both time and money necessary for the synchronization of the two systems. Besides, your employees need time to master the ERP system. The more complex it is, the more time they need. Future Upgrades. If your enterprise is heavily integrated into an ERP system, you may face multiple difficulties while implementing further customizations that affect the integration. But the aforementioned extension eliminates this problem for the Magento 2 ERP integrations. Long Learning Curve. The participation of users is very important for the successful implementation of ERP projects – hence, exhaustive user training and simple user interface might be critical. 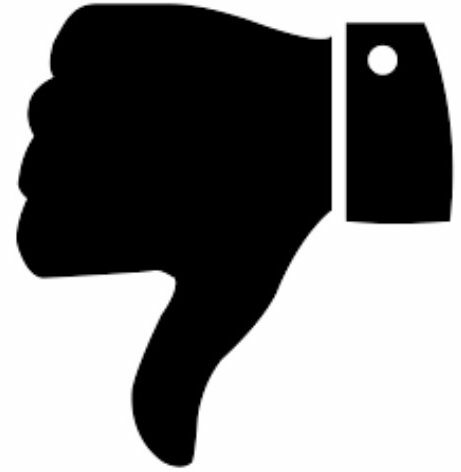 But ERP systems are generally difficult to learn (and use). Migration Problems. Usually, it is hard to synchronize your enterprise with an ERP system, unless you use Magento 2 and Improved Import & Export. The extension lets you seamlessly connect to an external system via API exchanging data between your e-commerce store and ERP. Vendor Lock-In. Once chosen, you are locked-in to a single vendor who provides you with the ERP functionality. Of course, it is possible to switch to another system, but don’t forget about all the related disadvantages of mastering a new ERP platform. That’s why we recommend you to evaluate everything prior to the implementation of an ERP system or switching to a new one. When daily duties consume more and more time, you need a solution that automates them. And it is ERP! If you spend the entire day managing key activities, it’s the first sign to start the Magento 2 ERP integration! If you have many unanswered business questions, it may also be considered a symptom of growth so that you need to integrate Magento 2 with ERP to avoid future problems. Even if the huge amount of unanswered question is caused by something else than your growth, enterprise resource planning software is designed to solve this issue. Also, run the Magento 2 ERP integration is you are no longer able to manage business processes. Connect your e-commerce store to ERP to manage inventory, satisfy customers, keep costs in check, etc. There are two ways to perform the Magento 2 ERP integration. Although both are based on using third-party extensions, they are related to a slightly different approach to the realization of the same goal. First of all, you can integrate your Magento 2 website with any ERP system with the help of our Improved Import & Export extension. 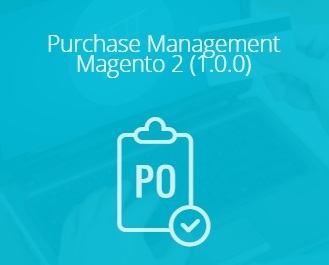 Alternatively, it is possible to perform Magento 2 ERP integration with a special connector or a module that adds the desired functionality to the platform. Let’s compare both approaches and describe core Magento 2 ERP extensions. The Improved Import Export Magento 2 extension has several competitive advantages over other modules. If you purchase a connector, it is limited by a single ERP system, so you cannot use the module to integrate your store with other third-party platforms. In the case of Improved Import & Export, the module covers multiple areas of usage. Thus, you can integrate your store into the accounting system, SAP, CRM, PIM, or any other platforms. And you don’t need to pay for each extra integration! With flexible presets (more and more will be available soon), the integration runs seamlessly. If there is no preset the allows connecting your Magento 2 store to the platform of your choice, you can freely use mapping in order to create two-way synchronization between your website and the ERP system. Furthermore, we can create an API connection instead of the default file exchange. You should only contact us to discuss the integration. As for third-party connectors, they may provide a more precise integration out of the box, but not always. Besides, there are several robust Magento 2 ERP extensions that add the ERP functionality right to the e-commerce platform. All the most reliable tools are described below. The extension imports about 3000 products per minute. Microsoft Dynamics. A popular ERP solution with multiple applications. 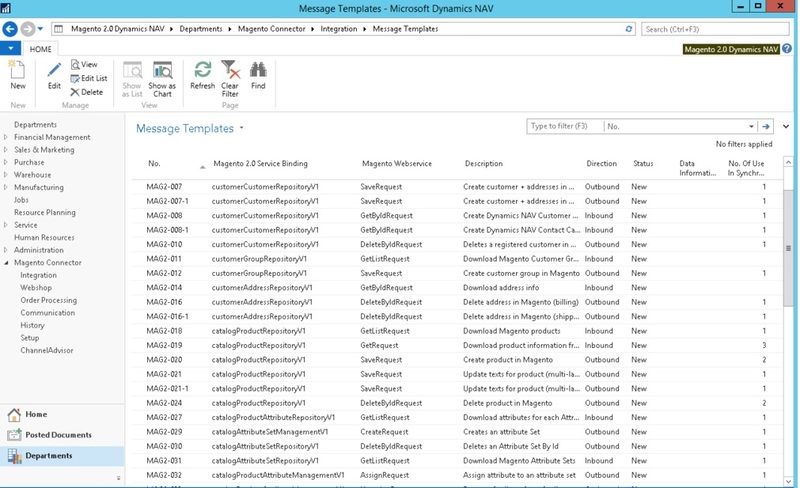 Magento 2 Microsoft Dynamics Integration. Odoo. An open source ERP that includes hundreds of apps covering all needs of every Magento 2 merchant. Magento 2 Odoo integration. Oracle Netsuite. An ERP system with more than 40,000 clients. Covers multiple areas and all basic business needs. Magento 2 Oracle Netsuite Integration. Also, check Oracle NetSuite ERP Overview. Deltek. This ERP allows reducing time and effort required for setup, deployment, and maintenance due to the cloud nature and user-friendly interface. Magento 2 Deltek Integration. Infor. An ERP with lots of industry-specific applications aimed at businesses of all sizes. Magento 2 Infor Integration. Kronos. A better way to manage your workforce. Magento 2 Kronos Integration. SYSPRO. ERP for manufacturers and distributors. Magento 2 SYSPRO Integration. Intact. An all-in-one ERP solution with the most vital accounting and business management tools. Magento 2 Intact iQ Integration. Ecount ERP. Top-notch efficiency for $55 per month. 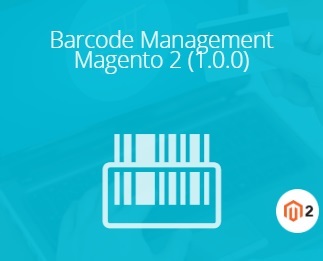 Magento 2 Ecount ERP Integration. SAP S/4HANA. The advanced ERP for complex business tasks. Magento 2 SAP S/4HANA Integration. SAP Business One. A reliable solution for small businesses. Magento 2 SAP Business One Integration. Priority Software. An ERP system with a large market of apps. Magento 2 Priority ERP Integration. ePROMIS Solutions. A modular and flexible ERP software for your e-commerce business. Magento 2 ePROMIS Integration. Shoptech E2. A system with 2 core products: Shop System and MFG. Magento 2 Shoptech E2 Integration. abas ERP. A set of management tools for businesses of all sizes. Magento 2 abas ERP Integration. Epicor. An advanced ERP system with industry-specific offers. Magento 2 Epicor Integration. Deskera. Avard-winning tools for businesses of all sizes and niches. Magento 2 Deskera Integration. Oracle ERP Cloud. Robust ERP tools at your fingertips. Magento 2 Oracle Cloud ERP Integration. Acumatica. 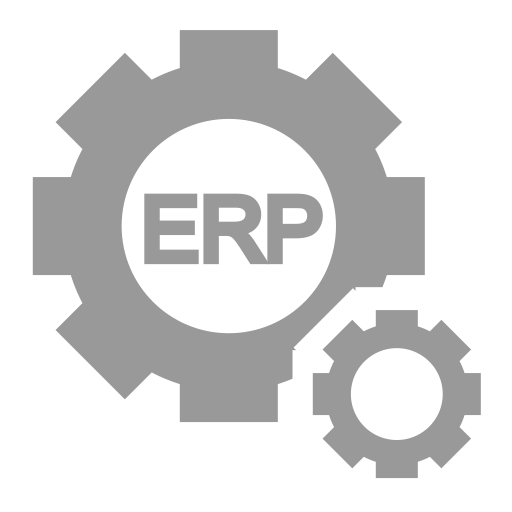 Industry-specific software solutions that include ERP for retail. Magento 2 Acumatica Integration. Plentymarkets. Omni-channel ERP tools and solution at zero fixed costs. Magento 2 Plentymarkets Integration. Sage 300. Advanced ERP system for your e-commerce needs. Magento 2 Sage 300 Integration. AccountMate. A flexible ERP with customizable source code. Magento 2 AccountMate Integration. Cougar Mountain Denali Summit. Various ERP tools with the system of add-ons. Magento 2 Cougar Mountain Denali Summit Integration. Open Systems Traverse. Industry-specific tools for various businesses. Magento 2 Open Systems Traverse. Khaos Control Cloud. An ERP system with multiple fully-featured applications. Magento 2 Khaos Control Cloud Integration. HarmonyPSA. An ERP system with no handoffs, modules, outdated data, and rekeying. Magento 2 HarmonyPSA Integration. M1. A single system designed to integrate all facets of your business. Magento 2 ECi M1 Integration. ERPNext. Another open source ERP for retail and multiple other industries. Magento 2 ERP Next Integration. TrueERP. A robust ERP system trusted by thousands of clients worldwide. 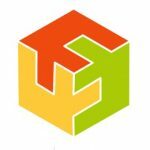 Magento 2 TrueERP Integration. Cetec. A flexible ERP system for small and medium businesses. Magento 2 Cetec ERP Integration. Passport Business Solutions. An ERP system with a long history. Magento 2 PSB Integration. Tally.ERP 9. The most popular ERP in India. 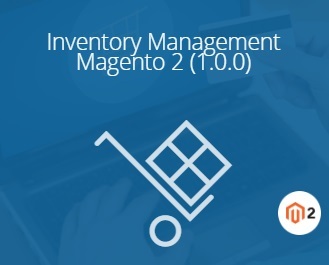 Magento 2 Tally.ERP 9 Integration. 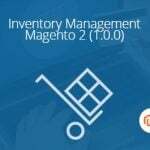 The Boost My Shop Embedded ERP Magento 2 extension is designed to improve your daily routine in the following three fields: inventory, supplier, and order management. Of course, all data can be easily viewed on different dashboards. And since all the necessary tools are available right within the module, there is no need to synchronize the tool with external services. Inventory Management. Embedded ERP provides the ability to read barcodes, track and transfer stocks, and receive alerts on low stock levels. Note that mass actions are supported. Supplier Management. With the extension, you can easily add suppliers and edit their data as well as track purchase prices, monitor supplier needs, manage purchase orders and backorders, as well as receive notifications related to various aspects of supplier management. Order Management. From this perspective, the Embedded ERP provides the ability to plan customer orders and their delivery. You can control packing and other features of order management. Although Magestore does not provide a fully featured ERP extension, there is a set of three modules that can be used as an ERP system: Inventory Management, Barcode Management, and Purchase Management. Note that the following Magento 2 extensions by Magestore are the part of the company’s Omnichannel Retail Software. This extension is developed to improve various operations related to stocks. The module allows you to edit, adjust, and transfer stocks in line. 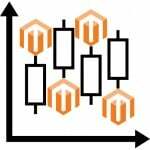 Stock prediction is also possible with the Inventory Management Magento 2 extension. 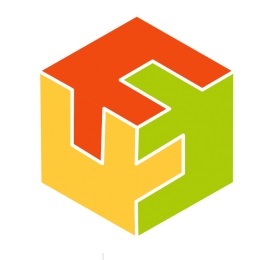 The tool supports multiple warehouses and you can easily connect it to third-party systems and modules. With this extension, you will turn purchase order management into a piece of cake converting POs from quotations or create them manually. Another great improvement is a combined interface that provides the ability to receive, return, and invoice products within a single interface. A reliable notification system is also a part of Magestore Purchase Management. It allows you to contact suppliers and inform them about orders and quotation with the help of emails. Barcode editing, CSV import, unlimited printing, templates management are core features of the extension. In addition to saved time, you will reduce the number of errors caused by the human factor after installing the extension. In case you are looking for an ERP Odoo connector, this Magento 2 extension will be well suited for your e-commerce store. This ERP integration Magento 2 module provides two-way communication between both systems, so you can easily synchronize data between Magento and Odoo. The extension syncs product, category, and customer data. Besides, it syncs orders and updates their state in real time. The same is about inventory synchronization. 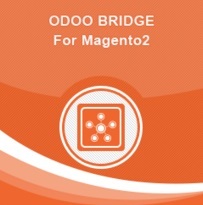 It is also necessary to mention that Odoo Bridge For Magento 2 by Webkul is compatible with odoo POS. By installing this Magento 2 module, you will seamlessly integrate your Magento 2 e-commerce website with Dynamics NAV ERP. If this system looks suitable, give the extension a try. With this ERP, you will be able to manage warehouse, inventory, customer, and supplier data in a completely new way. Brightpearl allows improving all your back office operations as well as marketing and customer retention not just for a single Magento 2 website, but all your sales channels. Pick the ERP software that matches your industry, size, and possible future growth. 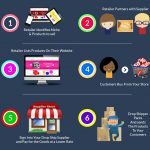 While small companies don’t need enterprise-level features, you should always keep in mind that a tiny market player can become a mid-sized e-commerce store, which in its turn has all the chances to move forward. You may also consider future growth from the perspective of entering a new market. Luckily, modern ERPs provide the ability to cope with both problems due to their modular nature and other scalability features. Make sure you get what your enterprise needs. Some ERP vendors may try to provide you with as many products as possible while 2-3 modules are enough to satisfy your actual needs. The problem usually occurs if you don’t provide potential vendors with a clear roadmap of your organization’s ERP requirements and desires. Always negotiate with your future partner to find a solution that truly suits your organization’s needs. Work with third-party specialists. You may involve external specialists at all stages of the Magento 2 integration from choosing a product to customizing it according to your needs. Chances are, your current employees are not the best specialists in the selected ERP system, That’s why it is a good idea to ask someone with the corresponding skills to help you. Contact your people. To prevent future problems, ask your employees what questions regarding the new ERP they have. Be transparent and team-oriented not only in your discussions at early stages but also when the ERP system is already connected to your Magento 2 store.